I am excited to finally, officially be able to say that we are LESS THAN two months away from Aveni and Nil’s July wedding day! We have had the best time getting to know this fun couple. From the very first time we met them, their excitement for the wedding has been absolutely contagious. It’s absolutely impossible not to share the joy that they bring to everything that they do. We knew that their engagement session would be particularly fun, and boy were we right! Spending the afternoon with Aveni and Nil exploring downtown Durham definitely didn’t feel like a bit of work. We adore the fun ideas that they brought into the session, including using Nil’s El Camino. We’ve got a few more epic photos that we are keeping under lock and key until after the wedding as well as another piece of work that we’ll share then too! 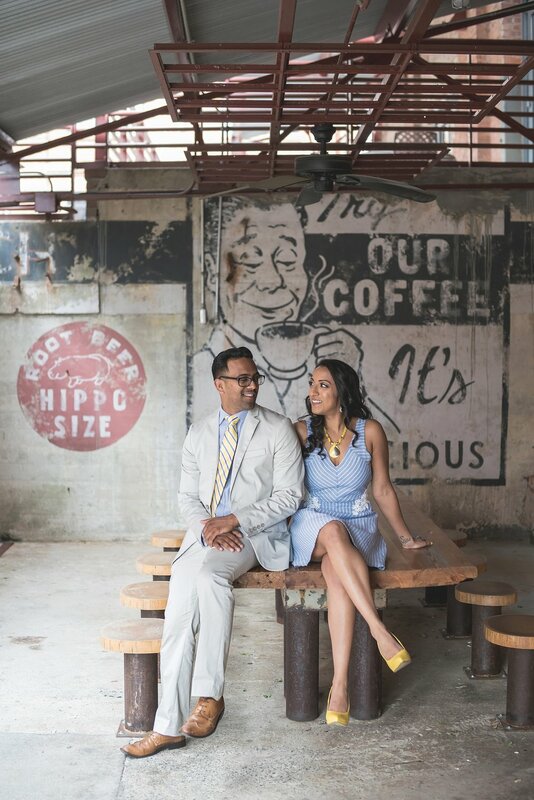 In the meantime, we hope you’ll enjoy this gorgeous couple’s downtown Durham engagement session. If you yourself are planning a session in the near future, take notes on their outfit choices, because they NAILED it from a fashion standpoint!! !